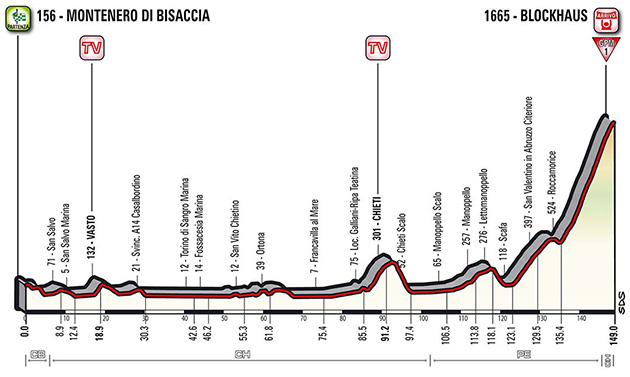 Weather at Chieti (km 91 of today's stage): 24C (76F), fair, with the wind from the ENE at 16 km/hr (10 mph). No rain is forecast. The Race: All 191 finishers of stage seven began today's stage at 1:08 PM. 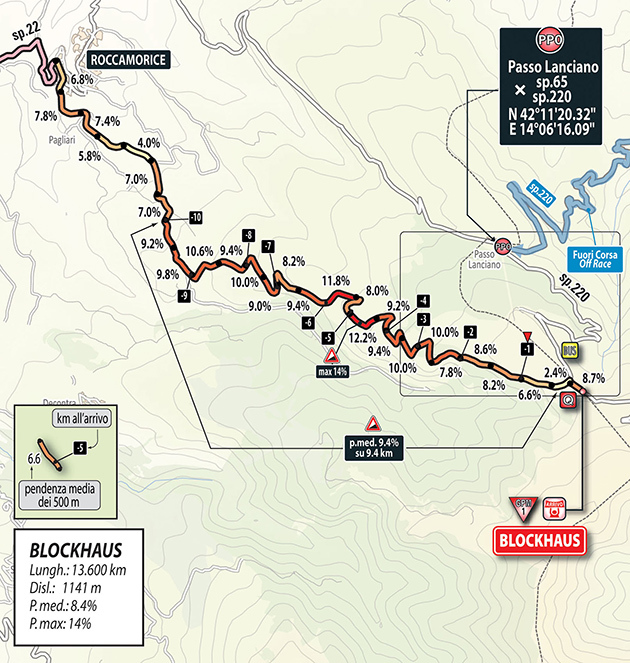 Today's stage finishes at the top of the legendary Blockhaus ascent. 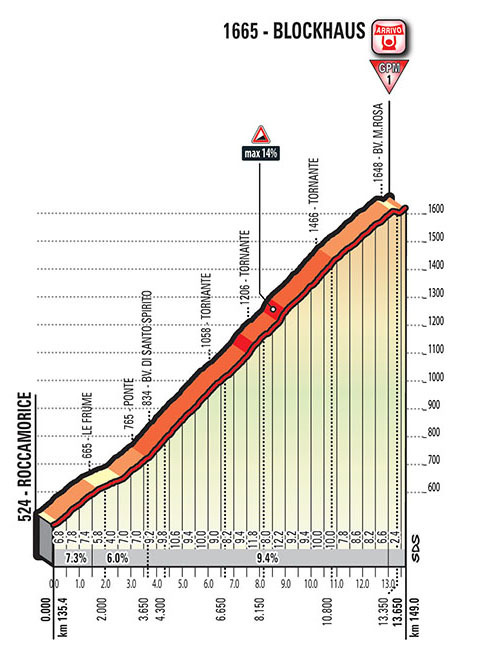 The climb is 13.6 kms long with an average gradient of 8.4% but has a patch of 14%. As the Blockhaus climb started to bite, the lead group of chasers containing the GC contenders ran into a police motorcycle parked on the side, not quite off the road. 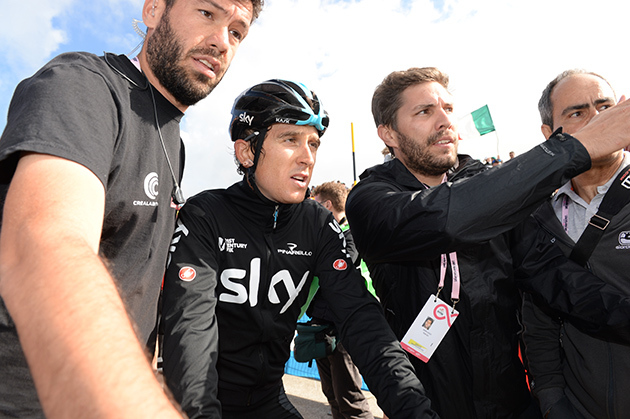 Geraint Thomas and Mikel Landa were among those who went down. Both were back up and chasing hard. 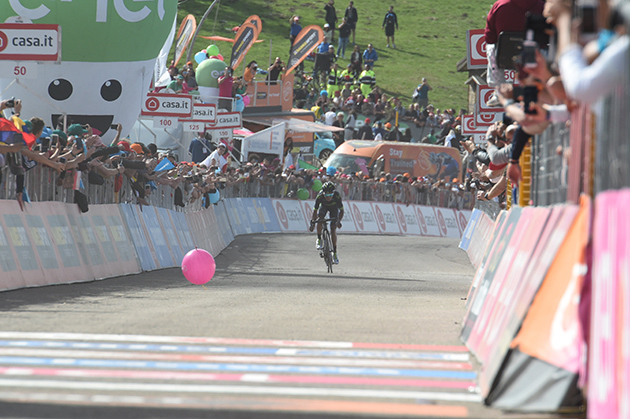 Up front, Nairo Quintana went clear with three kilometers to go to win the stage and take over the GC lead. Overnight GC leader Bob Jungels finished 15th, 3min 30 secnds behind Quintana. Nairo Quintana and the Movistar Team took a step forward in their aspirations to win the 100th Giro d'Italia as they claimed a convincing win on stage nine, 152km from Montenero di Bisaccia to the Summit of the Blockhaus (Cat-1), which saw the Blue squad taking over the race with an outstanding display. The labour by Sutherland, Bennati and Rojas, into the flatter sections; Amador, Izagirre and Herrada, taking care of the Colombian and starting the big selection at the foot of the climb; and a superb combined effort from De La Parte and Anacona to shatter the GC group during the ascent, all led to the decisive accelerations from Quintana, which started 7km from the finish and did not end before the Colombian left his whole opposition behind. Nairo left behind Vincenzo Nibali (TBM) and Thibaut Pinot (FDJ), the only ones able to follow his first move, and reached the finish line with 24" over the Frenchman and Tom Dumoulin (SUN), who climbed on his own pace to take 3rd; 41" over Bauke Mollema (TFS); 1' to Nibali and more than 2' over Zakarin (KAT). A crash against a motorbike took three big GC contenders down in Adam Yates (ORS; +4'39"), Geraint Thomas (SKY, +5'08") and Mikel Landa (SKY). It's the Movistar Team's 25th victory of a record 2017 season for the Blues and also for Nairo, who claims his sixth since February -37 as a pro cyclist- again in astonishing style. The Colombian will have a hard task to tackle on Tuesday at the rolling, 39km ITT stage ten from Montefalco to Foligno; however, a well-deserved rest day is waiting for him first on Monday. 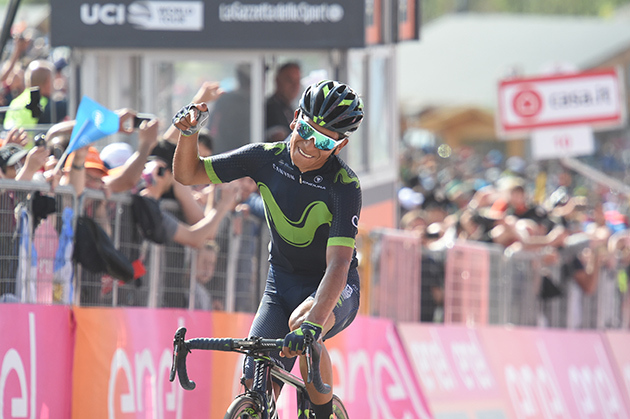 Nairo Quintana: "Such a great day! I wanted to show that both my legs and those of my team-mates were doing great. I feel strong and I'm pleased to see the whole Movistar Team riding this way. All of the boys have been simply outstanding, they worked their hearts out from start to finish, from the very first one to the last, at the exact moment they had to, and that also brings you extra motivation to give your best. "I knew it was important to open some distance with the biggest rivals before the TT. After my first attack I saw Pinot and Nibali being able to follow, but I continued to make attacks, one after another, until I was able to finally open a gap and carry on. 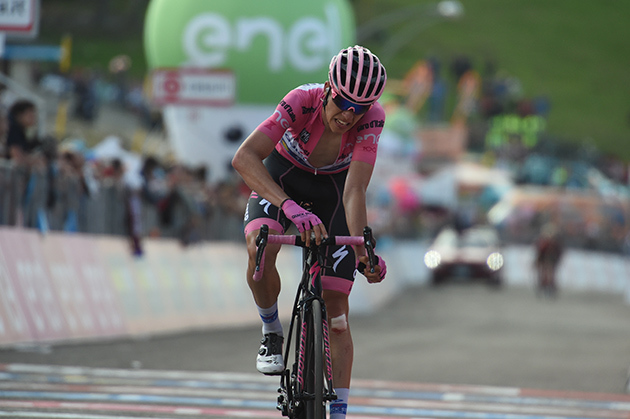 I just gave everything that I had - I'm so happy I ended up winning this stage and also wearing the Maglia Rosa before the rest day. We're really satisfied with the selection we created between the main contenders and taking these seconds on them. 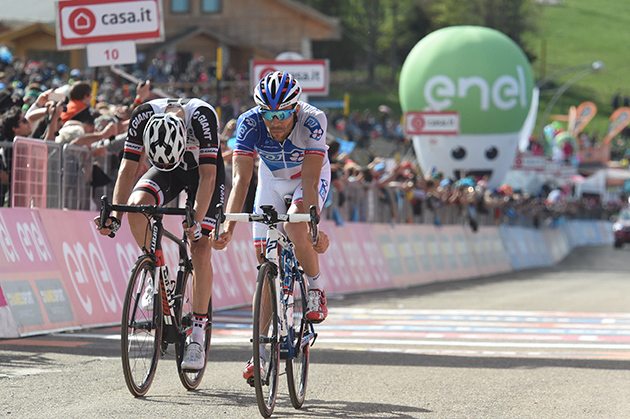 "There's still a long way to go in this Giro. We'll see after Tuesday's TT if these 30 seconds over Dumoulin are many or too few, but for the time being, I'm feeling good, with strong health, good legs, and that's what really matters so early in this race. This victory goes to all Latin American and Colombian fans; to Michele Scarponi, whom I regret so much about his passing; and also my wife and all mothers in their day." 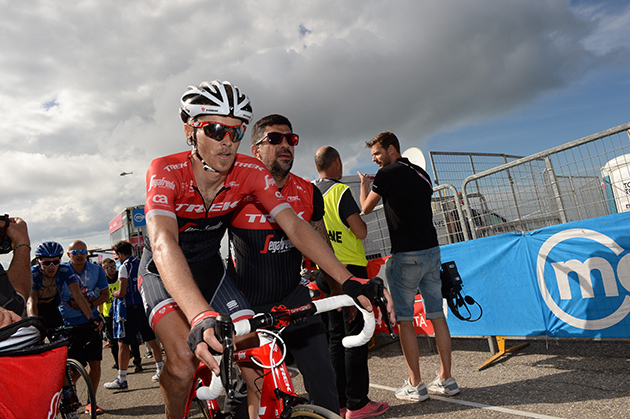 17 VAN GARDEREN Tejay BMC s.t. 18 PELLIZOTTI Franco BAHRAIN-MERIDA s.t. 24 KONRAD Patrick BORA-HANSGROHE s.t. 25 RODRIGUEZ MARTIN Cristian WILIER TRIESTINA-SELLE ITALIA s.t. 27 MONFORT Maxime LOTTO SOUDAL s.t. 30 ANTON Igor DIMENSION DATA s.t. 31 HANSEN Jesper ASTANA s.t. 36 CONTI Valerio UAE TEAM EMIRATES s.t. 39 FOLIFOROV Alexander GAZPROM - RUSVELO s.t. 43 DUPONT Hubert AG2R LA MONDIALE s.t. 47 GROSSCHARTNER Felix CCC SPRANDI POLKOWICE s.t. 50 HERNANDEZ Jesus TREK-SEGAFREDO s.t. 54 VERONA Carlos ORICA-SCOTT s.t. 57 HANSEN Adam LOTTO SOUDAL s.t. 58 BOARO Manuele BAHRAIN-MERIDA s.t. 59 VISCONTI Giovanni BAHRAIN-MERIDA s.t. 60 LUDVIGSSON Tobias FDJ s.t. 61 CAPECCHI Eros QUICK-STEP FLOORS s.t. 63 ROSSKOPF Joseph BMC s.t. 65 BERHANE Natnael DIMENSION DATA s.t. 66 TANKINK Bram LOTTO NL-JUMBO s.t. 75 PREIDLER Georg TEAM SUNWEB s.t. 76 RAVASI Edward UAE TEAM EMIRATES s.t. 77 BAK YTTING Lars LOTTO SOUDAL s.t. 78 DEVENYNS Dries QUICK-STEP FLOORS s.t. 84 TIRALONGO Paolo ASTANA s.t. 85 ROJAS Jose MOVISTAR s.t. 86 LOSADA Alberto KATUSHA-ALPECIN s.t. 87 TEKLEHAIMANOT Daniel DIMENSION DATA s.t. 90 MARCZYNSKI Tomasz LOTTO SOUDAL s.t. 92 ZEITS Andrey ASTANA s.t. 93 HAAS Nathan DIMENSION DATA s.t. 94 BERARD Julien AG2R LA MONDIALE s.t. 95 AMEZQUETA MORENO Julen WILIER TRIESTINA-SELLE ITALIA s.t. 97 ROLLAND Pierre CANNONDALE-DRAPAC s.t. 98 MONTAGUTI Matteo AG2R LA MONDIALE s.t. 99 OWSIAN Lukasz CCC SPRANDI POLKOWICE s.t. 104 BENEDETTI Cesare BORA-HANSGROHE s.t. 107 LADAGNOUS Matthieu FDJ s.t. 109 KOSHEVOY Ilia WILIER TRIESTINA-SELLE ITALIA s.t. 114 SANCHEZ Luis Leon ASTANA s.t. 115 JAUREGUI Quentin AG2R LA MONDIALE s.t. 117 VICIOSO Angel KATUSHA-ALPECIN s.t. 118 BILBAO LOPEZ Pello ASTANA s.t. 119 SHALUNOV Evgeny GAZPROM - RUSVELO s.t. 124 MARTINEZ POVEDA Daniel WILIER TRIESTINA-SELLE ITALIA s.t. 127 GOLAS Michal SKY s.t. 128 KEIZER Martijn LOTTO NL-JUMBO s.t. 129 VAN EMDEN Jos LOTTO NL-JUMBO s.t. 130 ZHUPA Eugert WILIER TRIESTINA-SELLE ITALIA s.t. 131 TCATEVICH Aleksei GAZPROM - RUSVELO s.t. 132 SAMOILAU Branislau CCC SPRANDI POLKOWICE s.t. 133 HOFLAND Moreno LOTTO SOUDAL s.t. 134 GIBBONS Ryan DIMENSION DATA s.t. 135 HEPBURN Michael ORICA-SCOTT s.t. 137 BRUTT Pavel GAZPROM - RUSVELO s.t. 138 STUYVEN Jasper TREK-SEGAFREDO s.t. 139 CASTELIJNS Twan LOTTO NL-JUMBO s.t. 140 DE BUYST Jasper LOTTO SOUDAL s.t. 141 MAESTRI Mirco BARDIANI CSF s.t. 142 BARBIN Enrico BARDIANI CSF s.t. 143 STAMSNIJDER Tom TEAM SUNWEB s.t. 144 GONÇALVES Jose' KATUSHA-ALPECIN s.t. 145 MOHORIC Matej UAE TEAM EMIRATES s.t. 147 TUFT Svein ORICA-SCOTT s.t. 148 JUUL JENSEN Christopher ORICA-SCOTT s.t. 149 ROVNY Ivan GAZPROM - RUSVELO s.t. 151 KOZONTCHUK Dmitriy GAZPROM - RUSVELO s.t. 152 SBARAGLI Kristian DIMENSION DATA s.t. 153 POSTLBERGER Lukas BORA-HANSGROHE s.t. 154 GESCHKE Simon TEAM SUNWEB s.t. 155 MUHLBERGER Gregor BORA-HANSGROHE s.t. 156 KIRYIENKA Vasil SKY s.t. 157 EWAN Caleb ORICA-SCOTT s.t. 158 KOREN Kristijan CANNONDALE-DRAPAC s.t. 159 CAMPENAERTS Victor LOTTO NL-JUMBO s.t. 161 KEISSE Iljo QUICK-STEP FLOORS s.t. 162 GAVIRIA Fernando QUICK-STEP FLOORS s.t. 163 KUZNETSOV Viacheslav KATUSHA-ALPECIN s.t. 164 HOWES Alex CANNONDALE-DRAPAC s.t. 169 BENNATI Daniele MOVISTAR s.t. 170 MEZGEC Luka ORICA-SCOTT s.t. 171 BENNETT Sam BORA-HANSGROHE s.t. 174 LAGUTIN Sergey GAZPROM - RUSVELO s.t. 176 SELIG Rudiger BORA-HANSGROHE s.t. 180 ANDREETTA Simone BARDIANI CSF s.t. 181 MODOLO Sacha UAE TEAM EMIRATES s.t. 182 MARTINELLI Davide QUICK-STEP FLOORS s.t. 183 BAUHAUS Phil TEAM SUNWEB s.t. Nairo Quintana heads to the line. And the race is Quintana's. Tom Dumoulin and Thibaut Pinot finish 30 seconds later. 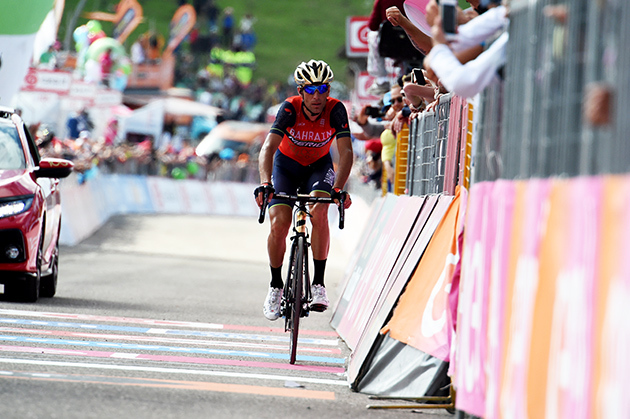 Vincenzo Nibali couldn't take what Quintana had to dish out today. 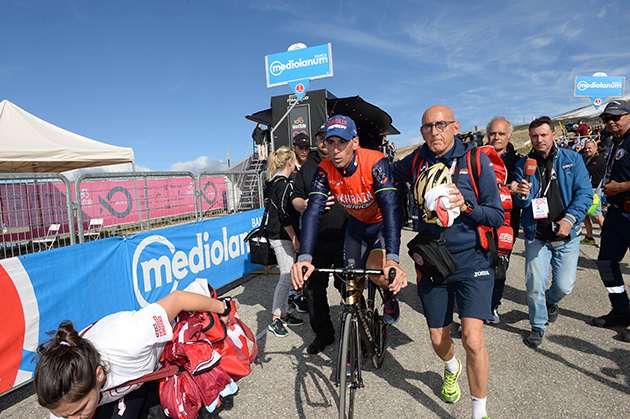 Nibali finsihed fifth, a full minute behind. 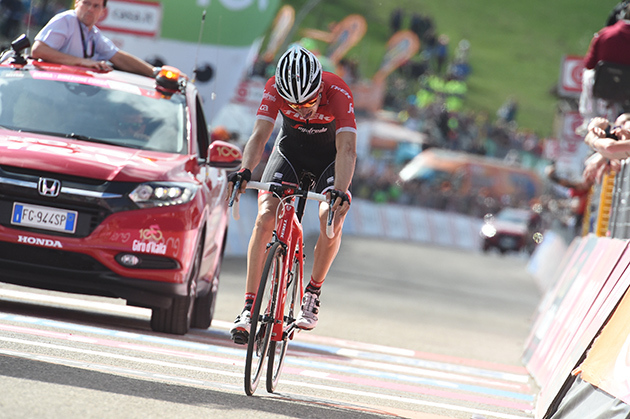 Overnight race leader Bob Jungels finished 15th, 3min 30sec behind Quintana. Along with several others, Geraint Thomas crashed in the early part of the Blockhaus ascent. Thomas finished more than 5 minutes after Quintana. 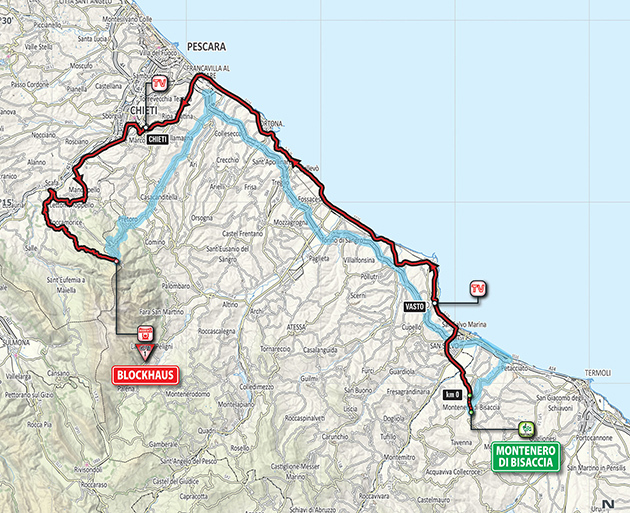 Organizer's stage nine preview: In the first half, the stage course is slightly undulating but the finale climbs up the steep Blockhaus ascent (Passo della Maielletta or “Mamma Rosa”) on the Roccamorice side. It is the toughest side of the well-known climb with its middle section measuring over 7 km in length at gradients of 9-10%. 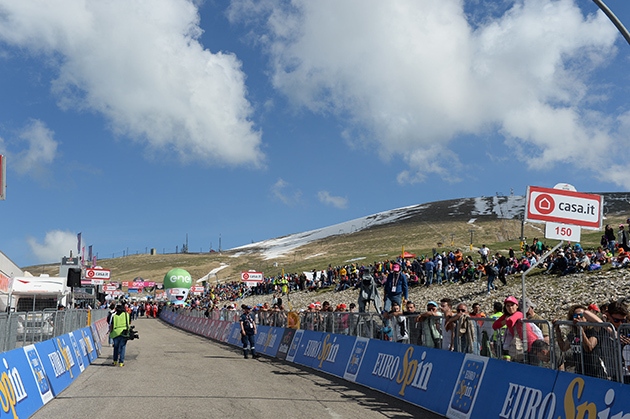 The finish is the same from 2009 at 1,675 m of altitude.